New series on the blog. I’m thinking I should highlight some conditions and exactly what they mean for the people who have them, to the best of my knowledge. Just want to spread a little awareness about various conditions out there. Knowledge is power, after all. And if we all try to understand each other a little better, it makes it easier to be kind to everyone. No matter what their circumstance. About a week ago, I went to a book signing by a lady from my church. She wrote a book about her struggles growing up with albinism. Her presentation and information session was incredibly informative and really brought forward not only the physical aspects of being different from everyone else, but also the social and emotional trauma that some people, including herself, experience. Truly, it was heartbreaking to hear, but at the same time, she managed to show how she overcame the odds and is using her time and effort to do something about the social stigma that is associated with albinism. I was inspired by her story, and thought I could help a little by making a post about it to spread awareness. 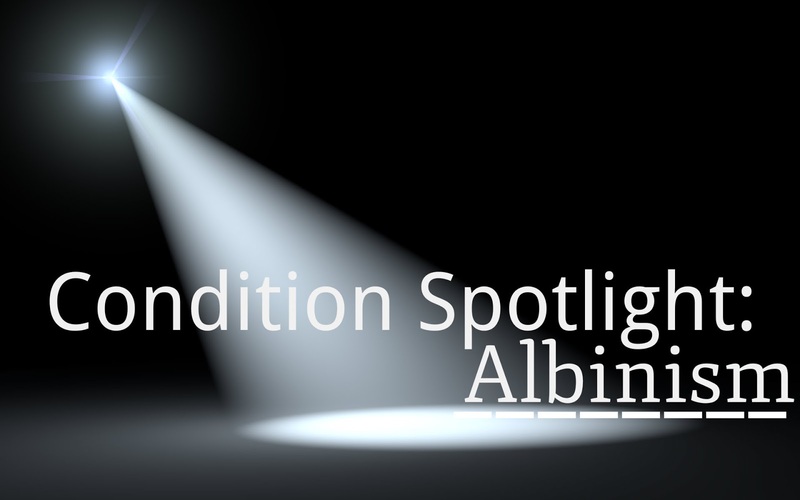 Albinism is a congenital (meaning it is not acquired, but present from birth) disorder of pigmentation that is characterized by a partial or complete lack of a pigment called melanin in the skin, hair and eyes. Melanin is produced by a special group of cells called melanocytes. Oculocutaneous Albinism: Types 1,2 and 3. Hair, skin and eyes are involved in varying degrees. Some may gain some pigmentation in their early childhood. X-linked Ocular Albinism: This type is inherited in an x-linked pattern and is therefore most common in males as the mutation is located on the X chromosome and involves just the eyes as hair and skin colour are usually within the normal range, or only slightly lighter than those in their family. Chediak-Higashi Syndrome: This is actually more known as an immune disorder, but one of it’s symptoms is partial albinism. The main issues come from not having the protective qualities of melanin. Most people know that this pigment is important but don’t know exactly how valuable it really is to us. The lack of pigment results in increased sensitivity to sunlight and risk of sunburn and skin cancer. All types of albinism come with vision problems. Photosensitivity, extreme near or farsightedness, eye movement disorders and astigmatism are all possible eye problems. There is no cure, but there are some treatment options available and precautions that can be taken to avoid complications. These include limiting sun exposure, and having regular eye exams and monitoring the skin for changes. There is of course the social stigma which is a big problem in many parts of the world, more in some than others. Children deal with name calling and social isolation, and in other parts of the world such as the Caribbean and Africa, though they are not the only places, they deal with much more such as being the subjects of destructive and harmful myths and superstitions. As a result many are treated terribly and even killed as a result of the condition. I think this is an important issue, because of course life is precious. Here is short youtube video talking a little more about the issues at hand. It’s hard to think about, but I imagine it must be even harder to live this reality. And this is a reality for many people out there. We can all take some time to educate ourselves, and I think the more people that know and understand albinism, the better chance we have of erasing the stigma around it. I still have to get in touch with the author of the book and ask her permission to post a picture of it and talk more in depth about her story, but I will certainly be doing that very soon. I was just inspired to try and do a little to spread some education and awareness about this condition. The last time I spoke with her, she told me she was working on getting the book available online, so as soon as that happens I will make another post strictly about the book and what she is doing with the proceeds of the book, because they do go to an amazing cause. Always be kind, because you never know what someone might be dealing with.